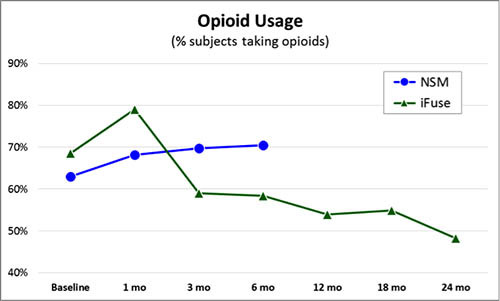 148 subjects were enrolled, randomized 2:1 (102 iFuse/46 NSM), and treated at 19 centers in the United States including both private practice and academic institutions. 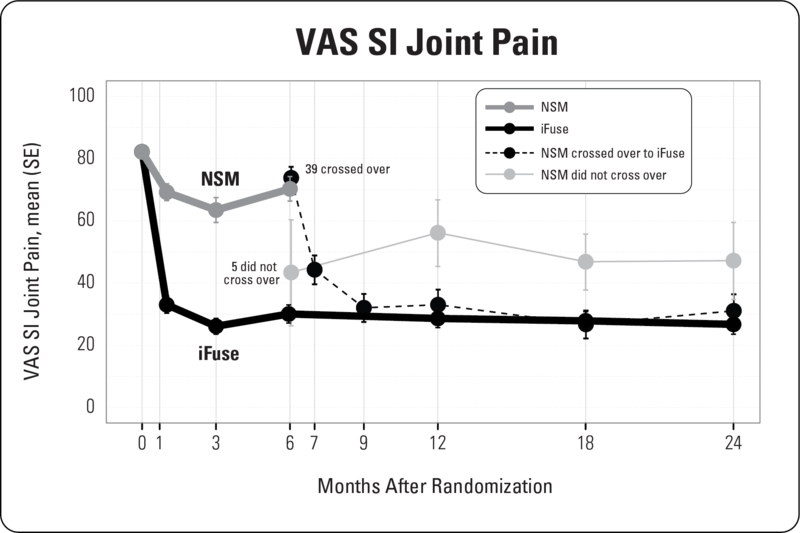 In the iFuse group, the mean SI joint pain score improved from 82.3 at baseline to 30.1 at 6 months, 28.6 at 12 months and 26.7 at two years, corresponding to improvements from baseline of 52.3, 53.7 and 55.4 points, respectively (all p<.0001, Figure 1). Disability, as measured using the Oswestry Disability Index (ODI), decreased from a mean 57.2 at baseline to 29.9, 28.3 and 28.7 at months 6, 12 and 24, representing mean improvements of 27.4, 28.9 and 28.4 points, respectively (p<.0001). The iFuse Implant System is a minimally invasive surgical option that uses titanium implants with a porous surface that acts as an interference surface, designed to help decrease implant motion, and allow for biological fixation to support long term fusion. iFuse is the only commercially available SI joint fusion device in the United States with published evidence that demonstrates safety, effectiveness and economic benefits, including three large multicenter prospective studies, two of which are randomized controlled trials (RCTs). Currently, there are more than 40 peer-reviewed publications supporting positive clinical outcomes, safety, biomechanics, and the economic value of iFuse. It is the only SI joint fusion product with a unique FDA clearance recognizing that clinical studies demonstrate improved pain, patient function and quality of life. Polly DW, Swofford J, Whang PG, Frank CJ, Glaser JA, Limoni RP, Cher DJ, Wine KD, Sembrano JN, and the INSITE Study Group. Two-Year Outcomes from a Randomized Controlled Trial of Minimally Invasive Sacroiliac Joint Fusion vs. Non-Surgical Management for Sacroiliac Joint Dysfunction. Int J Spine Surg. 2016;10:Article 28. doi: 10.14444/3028. Sachs D, Kovalsky D, Redmond A, Limoni R, Meyer SC, Harvey C, Kondrashov D. Durable Intermediate- to Long-term Outcomes after Minimally Invasive Transiliac Sacroiliac Joint Fusion using Triangular Titanium Implants. Med Devices (Auckl). 2016;9:213-22. doi: 10.2147/MDER.S109267. Vanaclocha-Vanaclocha V, Verdú-López F, Sánchez-Pardo M, Gozalbes-Esterelles L, Herrera JM, Rivera-Paz M, Martínez-Gómez D. Minimally Invasive Sacroiliac Joint Arthrodesis: Experience in a Prospective Series with 24 Patients. J Spine. 2014;3:185. doi: 10.4172/2165-7939.1000185. Rudolf L, Capobianco R. Five-Year Clinical and Radiographic Outcomes After Minimally Invasive Sacroiliac Joint Fusion Using Triangular Implants. Open Orthop J. 2014;8:375–83. doi: 10.2174/1874325001408010375. Duhon BS, Bitan F, Lockstadt H, Kovalsky DA, Cher DJ, Hillen T, on behalf of the SIFI Study Group. Triangular Titanium Implants for Minimally Invasive Sacroiliac Joint Fusion: 2-year Follow-up from a Prospective Multicenter Trial. Int J Spine Surg. 2016;10:Article 13. doi: 10.14444/3013. Martin BI, Mirza SK, Comstock BA, Gray DT, Kreuter W, Deyo RA. Reoperation rates following lumbar spine surgery and the influence of spinal fusion procedures. Spine. 2007;32(3):382-7. doi: 10.1097/01.brs.0000254104.55716.46.